I still like Nov. 1996 as a body double. Yes, that one is a better match but I guess I just don't consider 1996 that recent anymore. January-July 2012 had a real 1950s throwback vibe to them. That's how our weather used to roll. That's funny, I didn't really think of the wording. You're right. 22 years isn't that recent. This is the best thread on the forum. One thing that totally amazed me when I first looked at the Seattle city records is the fact February used to average colder than December. That seems almost unthinkable now that December has actually become slightly colder than January in the most recent 30 years averages. It has turned out pretty good all right. A lot of good information. A very rare November snow was unfolding in this area in 2010. It actually had been snowing on and off for a couple weeks already, but 11/23 over 8 inches fell at one of the stations here. The next day on the 24th a daily record low of -4 was set, with a high of 22. This was about a week before I moved to town. Ground accumulations briefly hit the 10-11 inch mark. I haven't seen anything close to that in November since that time. It was quite cold on this day 4yrs ago! A cold day in our warmest winter on record. 13 years ago we experienced one of the PDX NWS most embarrassing forecast busts. What happened? WSW that ended up being 35 degree rain? 11 years ago it was wet and breezy at the coast. Some land areas turned to water, and some trees stopped standing up. So.... the last time that it snowed measurably on this day in the Portland region was in...1880. You wanna talk about being due. Five years ago today it snowed. Just noticed that Medford's mean temp for December 2013 was 31.4. I need to check that against their historical records, but that seems rather astonishing. Looks like that is the coldest December on record at Medford (1928-present) narrowly beating out 1972 and 1976 (inversion fest). Medford somehow avoided that mid-month torch in 2013. I was in Texas at the time and was entombed in an ice storm there which was part of an amazing CONUS Arctic blast. They called if f*ck Florida week since the only place in the CONUS with somewhat "pleasant" temps was Florida south of the panhandle. I am sure the Dec 2013 blast was mentioned. So I'll mention exactly how cold that December was at KLMT. The Mean temperature was 22.7 (-6.8). Look at that monstrous -11.3 departure for avg low. I don't think I have seen an avg low like that in any other month. A couple of stations here are claiming the coldest December on record is 2013 in Klamath Falls. During the actual blast, I had 240 consecutive hours in a row below freezing temperature. Lots of frozen fog, it looked cool. Too bad I didn't have a very good camera back then. It looked like a different area that month. Below is a look at 10 of the coldest days. 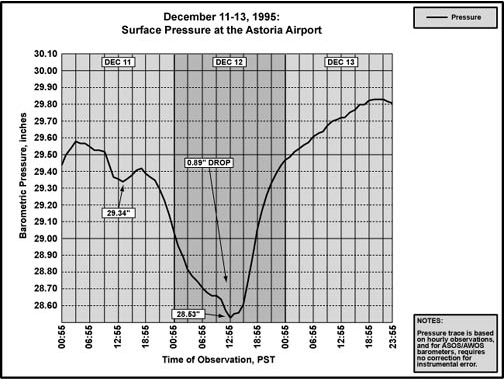 Exactly 20 years before this arctic blast, one of the strongest yet not often talked about tornadoes hit Newberg, OR on 12/08/1993. It was rated an F2. I believe only 5 recorded tornadoes in the PNW are F2/EF2 or higher. That particular one wasn't as destructive as others only because it wasn't that populated where it occurred. That 6/-20 day is absolutely insane. The COOP station for Klamath Falls didn't even get quite that cold in 1972, 1919, or 1990. I see that KLMT hit -22 on 12/09/1972, and -16 on 12/11/1972. I think a half dozen lows in December have records from 1972 but overall the 2013 blast was a touch colder. The all time record here is -25 so anything below -10 is pretty impressive. I hit -19 more recently on 01/06/2017 right after my 18.4" snow storm. Wonder why the WRCC site doesn't have their records? 10 years ago the models were currently VERY interesting. MOVE FROM SOUTHWEST CANADA INTO WESTERN WASHINGTON OVER THE WEEKEND. ACCUMULATING SNOWFALL BY SATURDAY MORNING. I clicked on this thread on my phone thinking this was the current month thread and started reading that discussion thinking it was written today. It actually might fit again if the 12Z GFS ends up being right! We had a little bit of snow two years ago today on 12/10/16. On this day 10yrs ago I was starting to not sleep well and was checking NWS Seattle and models constantly as well as the forum. Didn’t have a smart phone yet so I would have to use the desktop which was a bit of a pain and I still worked outside so limited computer access there as well! EXACT TRACK AND STRENGTH OF THE SYSTEM REMAINS UNCERTAIN. PROBLEMS BY FRIDAY AFTERNOON AND NIGHT. FOR SNOW TO ACCUMULATE AT SEA LEVEL IN MOST THE PUGET SOUND REGION. SOME ACCUMULATING SNOWFALL BY SATURDAY MORNING. BEFORE VENTURING INTO THE BACK COUNTRY. Would have been a lot of shoveling 99 years ago today south of Olympia. The world was purported to be coming to an end in 48 hours 23 years ago today. I had a slushy sloppy driveway on 12/10/16! Widespread 18-24" storm totals followed by widespread lows below 0 including the controversial -24 reading at McMinnville. I regard it as the greatest snowstorm arctic outbreak combo we've seen in the 1900-present era. 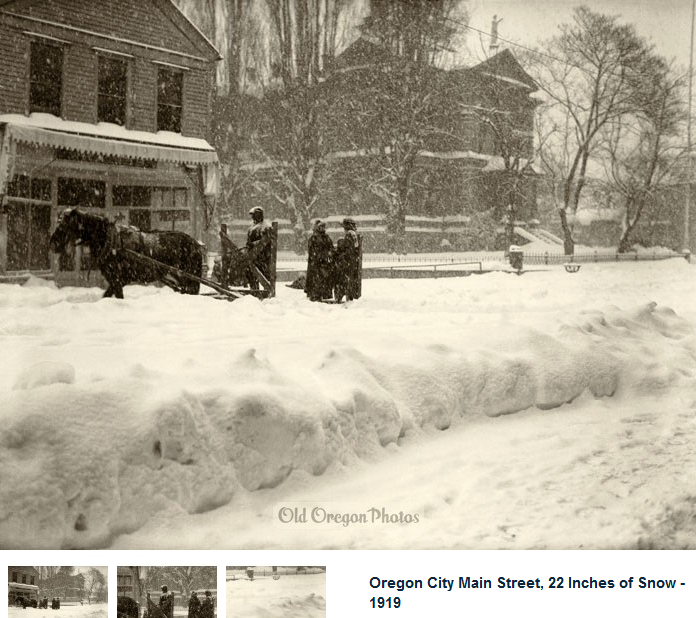 Salem had a 28/15 with 17.5" of snow on this date 99 years ago. While we are at it lets look at some extremes from that 1919 blast in W. Oregon. Eugene: - 3 (Downtown, I am sure it would have been colder at the present airport location. I love this. I ran across some great photos of Silverton from January 1909 a few years back. WESTERN WASHINGTON LATE FRIDAY AFTERNOON AND FRIDAY EVENING. I had a chunk of slush left in the mud 2yrs ago today! 5yrs ago today it was windy! Twenty-three years ago it was even windier. That was a great season for windstorms. I remember having to go out to our camper with the propane hot water heater to shower since we were without power for a few days. I also remember it snowing a bit when the power was out. EXCEPT PERHAPS THE IMMEDIATE COASTLINE. COLDEST WEATHER IN A COUPLE OF DECADES DURING THE WEEK AHEAD. MORNING ALONG WITH SNOW ACCUMULATIONS OF 1 TO 3 INCHES. DEGREES FAHRENHEIT...LOW ENOUGH TO CAUSE FROSTBITE TO EXPOSED SKIN. SNOW ACROSS THE WESTERN WASHINGTON LOWLANDS. Ten years ago tonight it did NOT snow. Unless you're currently super-droughty you don't count. A WINTER WEATHER ADVISORY REMAINS IN EFFECT UNTIL NOON PST TODAY. LOW WILL PRODUCE ANOTHER 1 TO 2 INCHES OF SNOW THIS MORNING. SHOWERS WILL DECREASE FROM THE NORTH THIS AFTERNOON. TEMPERATURES REMAIN NEAR OR BELOW FREEZING. I had a pretty sunrise and a frosty deck on 12/14/17.